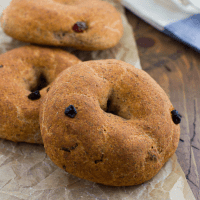 Author: Buckwheat Cinnamon Raisin Bagels! Gluten-free, vegan and easy to make! Make sure you are using raw buckwheat groats and not the toasted kind called kasha. These bagels freeze great! To eat from the freezer, I usually microwave the bagel for 30 seconds then slice and toast it. They taste delicious spread with butter and sprinkled with coconut sugar or spread with almond butter! Place the buckwheat in the jar of a dry, high-speed blender. Blend into a very fine flour. In the bowl of a stand mixer, combine the buckwheat flour, arrowroot powder, cinnamon and salt. Mix to evenly combine. In a large glass measuring cup, combine the water, yeast, and maple syrup. Whisk to combine. Add the coconut oil, flaxseed, and psyllium. Whisk to combine and let sit for at least 90 seconds and no more than 3 minutes, until it gets slightly gelatinous. With the mixture running on low, slowly pour the wet ingredients into the dry. Once they are all added, increase the speed to medium-high and beat for 5 minutes. Add the raisins and mix to combine.The dough will resemble thick cookie dough. Lightly grease a baking sheet or line it with parchment/a silicone mat. Using wet hands, roll about 1/2 cup of dough into a ball then work your fingers into the middle to create a whole. Make the hole slightly larger than a finished bagel as it will close slightly during rising and baking. Place on the prepared baking sheet. Wet your hands thoroughly in-between shaping each bagel. This should make 8 bagels. Let the bagels rise for 35-40 minutes. Preheat the oven to 400F. When the bagels are done rising, brush each one with some coconut oil. Bake for 35-40 minutes. Cool on the pan for 5 minutes then transfer to a rack and cool for another 10-15 minutes before serving. Enjoy!